WHITE PLAINS, N.Y., June 6, 2012 - USTA Serves, the National Charitable Foundation of the United States Tennis Association (USTA), today announced that it will grant 59 high school students a variety of college scholarships, totaling more than $410,000. 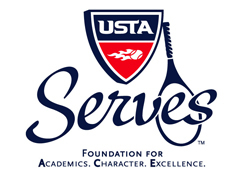 Two high school seniors from USTA Central Arizona - Nicolas Montoya (Scottsdale), Taylor Curley (Phoenix) were among those 59 national winners. Montoya, a graduating senior from Horizon High School in Scottsdale, earned the $10,000 Dwight Mosley Scholarship Award. The Mosley Scholarship is given to one outstanding ethnically diverse boy and girl from the United States each year with a focus on high achievement in both the academic and tennis realm. Montoya has been a standout player at Horizon, winning a state Division II Arizona Interscholastic Association singles championship in 2009 for the Huskies. Montoya has also been among the top-ranked players in his age division in the Southwest since he began playing junior tournaments. He will attend University of Notre Dame in South Bend, Ind. beginning this fall. 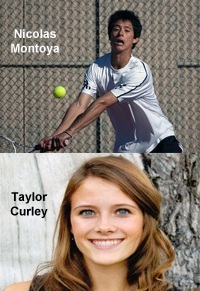 Curley, the senior class president at Phoenix's Sunnyslope High School, has an impressive academic and tennis resume. Curley held student government offices for three years at Sunnyslope, made all A's and B's for four years in honors and Advanced Placement courses, and received numerous awards, including the Presidential Award for Academic Success and was a winner of the Kiwanis Student of the Month. She is a member of the National Junior Honor Society, the Spanish Honor Society and the Key Club. On court, Curley helped lead Sunnslope to two second place finishes at the Arizona Interscholastic Association High School championships twice, as well as two other third-place finishes in her four-year run at the school. She played as high as No. 2 singles and doubles for the Vikings. Curley plans to major in veterinary medicine at Colorado State University in Fort Collins, Colo.
Congratulations to our two Southwest winners for earning these terrific national awards, and good luck in college and beyond!